(Photo: Susan Kim / World Council of Churches)Marchers converged at the Martin Luther King, Jr. memorial in Washington D.C. to march silently and then rallied on the National Mall on April 4, 2018. Hundreds of people gathered, then hundreds more, the crowd growing and marching in silence to the beat of a drum as dawn broke on April 4, 50 years to the day since Martin Luther King, Jr., was assassinated in Memphis, Tennessee. Commemorations ask what would Martin Luther King Jr. do in 2014? 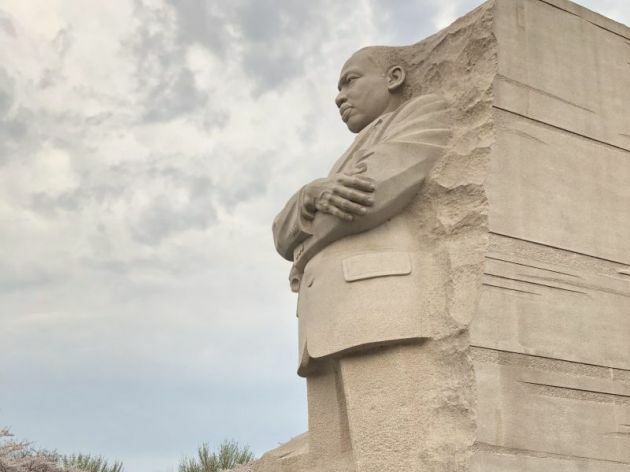 Led by organizers from the National Council of Churches of Christ in the USA, people moved past the memorial statue of King in Washington, D.C.. They found their way to the downtown mall, where they spent the rest of the day trying to find the words to frame what have become crucial - and painful - questions about racism in today's United States. The "A.C.T. - Awaken, Confront, Transform - to End Racism Rally," drew clergy, laypeople and peace advocates from diverse races, creeds and faith traditions, who gathered on what theologian Rev. W. Franklyn Richardson called "the front porch of our nation." Racism remains a stain on the soul of America, said Richardson, who is also chair of the Conference of National Black Churches, representing 20 million Christians in the USA. "When black and brown people seeing a better life in our country are cast as drug dealers and rapists, that stain is made visible," he said. "We cannot continue business as usual. We cannot wait any longer. We must move beyond our guilt." Eradicating racism means more than just changing personal attitudes, said speakers at the rally. It also means challenging and changing the racism woven into theology, systems and structures of society and, most of all, into the church. Jim Wallis, Sojourners founder and author of Racism: America's Original Sin, said it is time for white Christians to tell the truth to God. "Without confession to the sin of white racism, people who call themselves white Christians will never be free," said Wallis. "White Christians, since the founding of America, have been living a lie. We reject the resurgence of white nationalism - including in the highest level of power in this capital city." Even while the rally drew spirited signs, singing and applause, leaders acknowledged that the actions needed to take place within churches, communities, and cities over months and years to come. "I am suggesting that this truth and reconciliation process take place, but it can't take place on this mall," said Rev. J. Herbert Nelson II, stated clerk of the General Assembly of the Presbyterian Church (USA). "We can overturn the tables in this temple. Let's go home and make a home for those who don't have one on this journey of life." In a video message, Rev. William J. Barber II, a member of the national board of the National Association for the Advancement of Colored People, said the USA must deal with the real Dr. Martin Luther King - "the Dr. King who came here not just for the kumbaya but for jobs and justice." Rally-goers emphasized the importance of churches in helping people and communities develop the moral capacity to not just fight racism but to go further and build a society that honors the dignity of every person. "My job this morning is to ask an urgent question that lies at the heart of this multiracial gathering," said Rev. Jennifer Harvey, professor at Drake University. "Dear white Christians: what now?" She urged people to explore the difference between reconciliation and repair. "We are living in a Black Lives Matter era, and a white pseudo-Christian nationalism is taking up more of the bandwidth as I speak," said Harvey.